This year, 2010, the venue for the Baltic Audiovisual Archival Council (BAAC) Annual Conference was the Latvian Academic Library, situated in Riga, the capital city of Latvia. Conference hosts included: The Latvian State Audiovisual Archives, Directorate General of the Latvian State Archives and the National Library of Latvia. The conference was preceded by a BAAC Board meeting on October 3 at the Hotel Radi un Draugi. The formal title of the conference was: "Back to analogue: preserving audiovisual resources for digitalisation and posterity ". The programme committee addressed the level of development and progress in the field of digitalisation of audiovisual archives in the Baltic countries. Hit by the global financial crisis, this activity has been affected by the economic situation of all three countries- Estonia, Latvia and Lithuania. The Board of BAAC was well informed and keen to follow up on the question of publishing new digital systems. Highlights of the conference, therefore, meant studying and analysing in retrospect, analogue and other original materials which had been used and archived for all these years. The conference had a now well-established traditional opening ceremony. The president of BAAC, Juozas Markauskas and Gunars Medins of the Latvian State Archives of Audiovisual Documents presented the programme and welcomed all delegates. The Norwegian Ambassador, H.E. Jan Grevstad, gave a speech on the importance of working with audiovisual archives and also the importance of freedom of speech and information. He gave a short history of BAAC. The Canadian Ambassador, H.E. Scott Heatherington, in his welcoming speech talked about the historical connection between Canada, Latvia and the Baltic States. The first session was moderated by Andris Kesteris, the BAAC Canadian connection. The current circumstances of Estonia in the field of preservation were presented to an attentive. The Head of Preservation of historical archives of Estonia, Ruth Tiidor, reported on the present status and about future perspectives. She is responsible for approximately 8.721.407 items, including 8.8 million meters of film, 460 000 photos, 14000 sound recordings and last but not least, 1530 videos. The staff compliment is 210 persons. On the question of vinegar syndrome and nitrate positives and negatives? "...film archives have been constantly busy with the inspection of their materials which are developing vinegar syndrome, as well as nitrate-base photo negatives and films..."
The situation and work in Lithuania was the topic of the next paper to be presented by Jole Stimbirytė, the Head of the Documents Storage Department, Lithuanian Central State Archive. The title of the paper was: "Preservation of analogue audiovisual holdings in Lithuanian Central State Archive: practical approach to the current problems ". The main aims of the Lithuanian Central State Archive are to collect and safeguard paper-based and audiovisual documents including films, photo documents, sound recordings and video recordings. Public access to the collections has been introduced. The life span of old tapes and films depends on the storage conditions. Maintaining a constant value of temperature and humidity in the storage rooms for films and tapes is a must. Vinegar syndrome and nitrate films are on-going problems. These are issues which have to be dealt with soon if the collections are to survive. Art, situated in Riga, Latvia. The title of his paper was: "Discovering the Material: Taking inventory of material to be processed ". The holdings of the Archives of Latvian Folklore (ALF) consist of manuscript documents, texts, pictorial documents like drawings, photographic images and negatives, audio and video documents. The digitalisation work at ALF started with the transfer of the existing data into a computer-file format. The aim of the archive is to preserve documents placed in its care, not to mention that use of the contents must be ensured. The papers presented at the second session were dealt with by professionals with experience in three countries which are at some considerable geographical distance from the Baltic region: Australia, Wales, and Iceland. Ray Edmondson, from Australia, could not attend in person, therefore his paper was read by Andris Kesteris. Tedd Urnes provided a background on Ray Edmondson whom he had met for the first time at a FIAT/IFTA conference in Bogensee, Germany in the year 1994. The title of his paper was: "Of Cabbages and Kings: Digital Reflection in an Analogue Looking Glass". At the end of his paper he wrote. "...We have a responsibility to think independently of fashions and to treat our collections holistically and with a long term view. I am convinced that our successors will be preserving analogue documents a hundred years from now, that they will be maintaining at least some of the associated technology, and that they will be extremely glad that their predecessors - that's us - had the foresight to save rather than discard. By then there will have been a far greater appreciation of analogue carriers as artefacts than now exists. By 2110, how many of them will still survive? How many will still be being created?" - Ray Edmondson. He has also published a book in the field of archiving and philosophy: "Audiovisual Archiving: Philosophy and Principles " (CI/2004/WS/2,Paris, 2004). The Spanish version: "Filosofia y principios de los archivos audiovisuals". (Mexico, 2008). Ray Edmondson, Archive Associates Pty Ltd, is former President of South East Asia-Pacific Audiovisual Archive Association (SEAPAVAA). The National Library of Wales was presented by Dr. Michael J. Pearson. The title of his paper was: "Audiovisual material in "traditional" archives: a problem or a challenge ". From Wales we went to Iceland to be informed about preservation policy of audiovisual materials. The title of the paper of Piret Laas was: "Audiovisual Heritage on the Saga Island. The Icelandic Collections". Too many transmitted television and radio programmes have been wiped due to a strict selection policy. Session three was chaired by Gatis Karlsons from Latvian State Archives. The panel consisted of Tedd Urnes (TAAM), Ivi Tomingas (Estonian Film Archives), Dalius Zizys (Lithuanian Central State Archive) and Gunars Medins (Latvian State Audiovisual Archives). national archives of the Baltic countries, reports from Norwegian Broadcasting Corporation (NRK) and Swedish Television (SVT) were presented by Tedd Urnes. The issues dealt with were: storage rooms, long term preservation of the collections, vinegar syndrome, nitrate films, and what to do with old tapes and films after digitalisation of the materials? What about temperature and humidity of the storage rooms? The difference between the responsibility of television companies and national archives in the field of preservation was of great interest to participants of the panel. In the evening, after a long day of many interesting lectures, exchanging information and meetings with new friends, an opening reception was organized at the University of Latvia sponsored by the Norwegian Embassy, the Canadian Embassy and BAAC. Session four took place on the second day of the conference, October 5. The first paper to be presented dealt with the national recording industry in the Baltic area. Pekka Gronow, who had written the document, could not come from Finland, therefore, the paper was read by Aldis Putelis. The title of the document was: "The Emergence of a National Record Industry in the Baltic area ". The Finnish author also evaluated the situation of the record industry in Scandinavia. Guna Žurina, working with the Latvian Radio Sound Library, focused on issues regarding sound libraries. The title of the lecture was: "Electronic Metadata and Digital Audio: The Experience of Latvian Radio Sound Library ". The last subject to be evaluated in session four included issues about radio and television in Lithuania. Jonas Korys, Lithuanian Radio and Television, presented the future plans of the broadcasting archives within the company. He called his presentation: "Towards integrated model of broadcasting archive ". The main message revolved around cooperation of various archives and working towards a common goal. In session five, we were introduced to archival issues in Estonia. Paavo Annus, working with the Estonian Film Archive discussed sound recordings on acetate discs. The title of his document was: "Sound recordings on acetate discs. Preservation risks and experiences". The second contribution in this session dealt with photographic negatives in Latvia. Ina Lastovecka, Latvenergo Power Museum, Latvia, presented information about Eduards Kraucs and his work. The title of her paper was: "Eduards Kraucs' Collection of Glass Plate Photographic Negatives- the Course of the Construction of Kegums Power Station 1936-1940". Interesting and historically significant photos of the building of the power station were shown. Merilis Roosalu, working with archival photos at the Estonian History Museum, is an expert with a Masters Degree in the field of photographic preservation. The title of her paper was: "A photograph is as if a thin leaf of memory- easily influenced by the wind of emotions and time ". With reference to the preservation work carried out, the paper was illustrated with fascinating examples. The last session of the day, session six, was chaired by Piret Noorhani. Marko Leppik from Wiseman Interactive discussed various projects that the company is working on. The title of his presentation was:" Example of Estonian Art Museum: Digital archives for artwork restoration. Why digital mark-up is a way to go!" The last two papers were presented by Tedd Urnes, Teddview Audiovisual Archival Management (TAAM). He was preoccupied with two main issues: Management of television archives - past and future - and a critical approach to the production of historical documentaries where the content was dominated by use of archival footage. The titles of the papers were: "Management issues: Television archives in a time of great technical changes" and "Television Archives: Content description of the collections of television archives". In addition to getting the special treat of visiting the University of Latvia's astronomical observatory, participants were able to visit Latvian Radio, the Sound Recording Library of the Music Academy, Latvian State Audiovisual Archives and the Riga Motion Picture Studio. 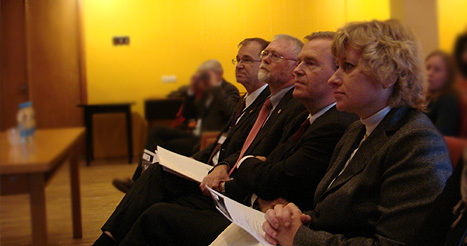 The origins of delegates attending the conference included Estonia, Latvia, Lithuania, Norway, Sweden, France, Germany, Poland, United Kingdom, Wales, Iceland and Canada.